Does anyone have this already? It's got good reviews on the web, so i'm hoping this will give me a few ideas as what materials/designs were used during this time. 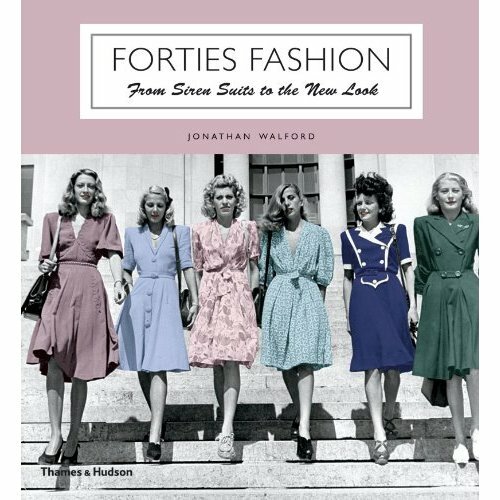 I've also started following Fashionable Forties, which is a blog dedicated this style of clothing. I've been wanting to make my own collection for a while, and sewing clothes inspired from this decade just seems natural to me. I find it fascinating reading about the construction of clothing back then due to rationing, and their 'make do and mend' mantra. As soon as I finalise my designs i'll do a featured post on this endeavor! Blanche and Lola was founded by jewellery designer Amy to offer beautiful, unique handmade vintage jewellery with a modern twist. The inspiration was born out of a lifelong love for all things sparkly and pretty and a desire to salvage the cherished treasures of the past and ensure they are continued to be loved, instead of forgotten. All vintage pieces are hand selected and restored or lovingly transformed into an entirely new creation, so you can have your very own piece of history, worn in the present to celebrate your future. Our designs are intended to be contemporary and wearable for all sorts of occasions, because we all deserve a little loveliness in our lives! Here's some pics of my favourite items! My project for this week..